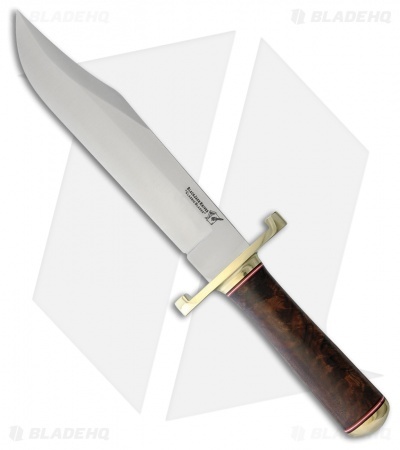 This BlackJack Model 129 is a substantial hunting fixed blade with a classic Bowie knife design. Its blade is made from durable A-2 steel with a convex grind and a satin finish. The handle is made from tapered Turkish walnut wood and comes paired with a brass pommel and guard. The Model 129 includes a genuine leather sheath with a loop for secure belt carry.